Mermaid is able to provide a vast array of Teak, Mahogany, Ash, Oak, Maple, and Cherry supply vents to be used for those application where appearance is important! 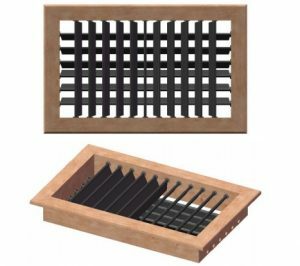 We stock most sizes of Teak vents ranging from 4″ x 4″ to 14″ x 12″. There is an additional lead time of approximately 2-3 weeks for the other species. Mermaid also is able to provide Wedge Supply air vents. Each Wedge vent is build on a 45 degree angle to allow the airflow to disperse upwards in the cabin. These are ideal vents for counter top or shelf vent installations. Each flat grill is measured by it’s “cut-out” dimension. Ensure that you leave 1/2 inch around the vent for the “lip” of the grills. The louvers on each vent are adjustable. Each grill size in calculated in inches. Be sure to select the appropriate transition box, or ring with either supply air vent style for the ducting to attach to.